“Neither the cities, the cultured lands nor the villages or their houses are ours. KRISHNA, the god in Hindu mythology, is said to have lived a simple life. He danced with peacocks, splashed in the rivers, played the flute that mesmerised humans and animals alike and spent his time in the forests herding cows. Srivatsa Goswami, a Vaishnava scholar, considers Krishna’s life to be “the greatest chapter in environmental history”. “One who is devoted to Krishna can never be callous towards the environment, because Krishna himself loves nature,” writes British author Ranchor Prime in his book, Hinduism and Ecology: Seeds of Truth. Today, Krishna’s devotees are divided in their bhakti. While one camp wants to glorify their master through magnificent temples, the other believes in reviving the very forests where Krishna grew up, now lost to urbanisation. The former thinks erecting monuments dedicated to Krishna is the best way to spread his message; the latter says the right way to honour him is following in his footsteps and caring for the environment. What emerges from these differences of opinion is polarisation in Krishna worship and a debate on the idea of bhakti. Taking inspiration from his words, ISKCON plans to build a large and swanky temple in Vrindavan dedicated to Krishna. “An imposing temple would proclaim the status of Vrindavan as one of India’s spiritual capitals and attract global attention towards Krishna and his message,” explains Suvyakta NarasimhaDasa, president of the Vrindavan unit of Akshaya Patra Foundation, a charitable body set up by ISKCON to look after the new temple. On the other hand, Braj Foundation, a non-profit led by senior journalist Vineet Narain, focuses on rejuvenating the forests associated with Krishna’s life. “Krishna was a primordial environmentalist. This is my way of worshiping him. One who serves Braj serves Krishna,” Narain says. Braj, spread across 5,000 square kilometres around Mathura-Vrindavan in Uttar Pradesh, is Krishna’s own body, claim vedic texts. Once upon a time, the region had 137 forests and 1,000 kunds or water bodies. Today, only three of the 137 groves, associated with the legend of Radha Krishna, remain, while the rest have been lost to rapid urbanisation. 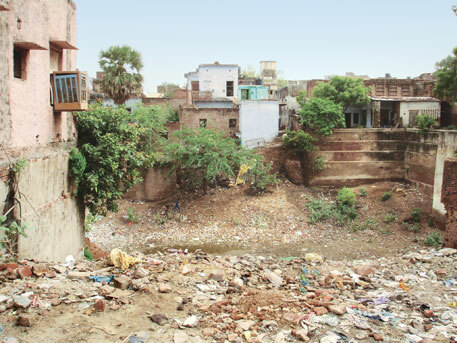 Most of the kunds have either silted up, been encroached upon or have become garbage dumps. Braj Foundation aims to rejuvenate the water bodies, forest groves and hills in Braj, in what it considers is the best form of Krishna bhakti. If Braj is abundant in forests and kunds that find mention in vedic texts, it also houses brick monuments dedicated to Krishna. Vrindavan, where Krishna spent his childhood and adolescence, is called the “heart of Braj”. Today, the town has at least 5,500 temples and hundreds of dharamshalas (shelters) and hotels to cater to more than six million tourists who visit the town every year. ISKCON’s proposed temple will be another addition to Vrindavan’s concrete jungle. The Chandrodaya Mandir is being built on the outskirts of the town in collaboration with the Kolkata-based Infinity Group. The glass-and-steel temple, spread over 2.2 hectares, is set to be the world’s tallest, measuring 210 metres with 70 floors. This is taller than the Qutub Minar in Delhi, which is 70 metres tall. The foundation stone for the proposed temple was laid in March this year and construction is expected to be completed in five years. 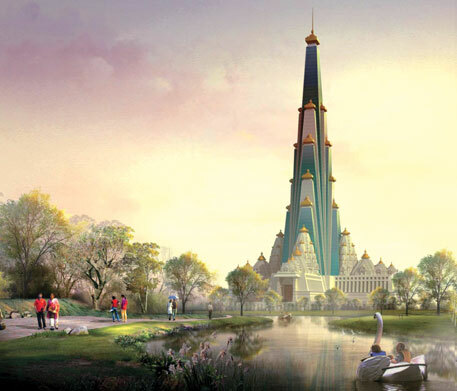 According to the project brief of Chandrodaya Mandir, the grand temple will be surrounded by 12 hectares of forest area to recreate the forests of Braj, including the 12 verdant forests, mentioned in Srimad Bhagvatam, where Lord Krishna is believed to perform his raasleelas (love plays). A Yamuna creek that will be recreated in the forests will provide boating opportunity to visitors. The building will also house a helipad, an amphitheatre, a hi-speed lift and a 4D theatre. The entire project area spreads across 60 hectares, equivalent to the size of six Akshardham temples in Delhi, and will also comprise residential villas and apartments with modern facilities. In its eagerness to serve Krishna, ISKCON seems to be indifferent to the troubles Brajwasis (people of Braj) might face from a grand temple in their vicinity. 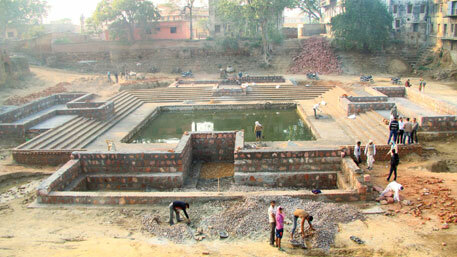 The water for the temple, toilets, kunds and the creek would be extracted from the ground. “The Yamuna is 5 km away from the project site. As it is difficult to lay a pipeline for such a long distance, we have identified a groundwater source 3 km away from the temple. Soon, boring will be done and pipelines will be laid,” Dasa says. He claims that the Foundation has already acquired environmental clearance for the project from the State Environment Impact Assessment Authority. Dasa estimates that the temple will consume 5-6 megawatt (MW) of electricity per day, of which 2 MW would be generated from the solar panels in the temple’s parking lot, which can hold 2,000 cars, while the rest would be bought from electricity grids. Jagannath Poddar, head of Friends of Vrindavan, an environment non-profit, says that urbanisation and prolonged negligence have pushed the kunds, also known as sarovars, in Braj to extinction. These kunds once served as perennial sources of freshwater. “It is sad to see the resources of Vrindavan being destroyed by people who are promoting real estate business here in the name of Krishna,” he adds. Braj Foundation has been striving to restore the ecological, architectural and cultural heritage of Braj, which it says reflects the “intertwined relationship between environment, people and the Supreme Lord”. 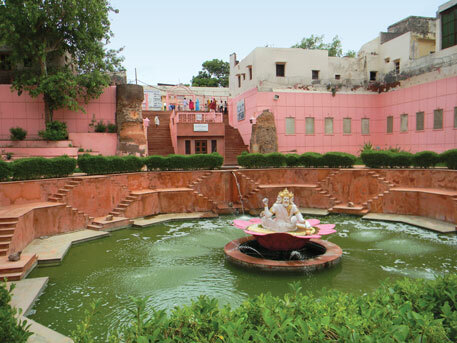 Since its formation in 2005, the non-profit has restored 46 water bodies, three heritage buildings and two forests in Braj. The foundation has also been campaigning against mining on the hills. It plans to restore all 1,000 kunds in Braj associated with Krishna. In 2006, it took up work to desilt the Rudra Kund in Jatipura village in Braj, remove encroachments and restore the water body. But it faced opposition from encroachers, who went to the Allahabad High Court and got a stay order against the renovation of the kund. The order was lifted after five years of legal battle. In June 2011, the Braj Foundation resumed its work and with the help of the district administration and police, demolished unauthorised construction around the kund. Once dry and filled with garbage, Rudra Kund now sparkles with clean water. “After we desilt the kunds and declog their recharge wells, we start working on their beautification so that people know the religious and historical significance of the place,” Narain says. He adds that the funding for their work comes from private sponsorships. The non-profit also focuses on planting trees like kadamba, radha and krishnachura associated with the legend of Radha Krishna. It promotes cow-based agriculture and organic farming too. “Butchers are stealing cows and killing them for meat. Most of the charitable gaushalas (cow shelters) do not have very goods standards of care. We aim to reestablish the economic viability of the desi cow,” he adds. Swami Sivananda of Matri Sadan Ashram in Haridwar believes people have misinterpreted Hinduism. “While temples and memorials to mark sacred places are necessary, building a 70-storey temple in a place where there are a thousand others is showing off,” he adds. Prabhupada's comment on skyscrapers here has misquoted. He said that in the sense that everything can be utilised in the service of Krishna, not that skyscrapers are the only thing we can construct for Lord Krishna. I agree with you. Srila PrabhupadaÃ”Ã‡Ã–s teachings have been towards a sustainable environment and nature conservation. I agree that he when he spoke about building skyscraper for Krishna, he meant it symbolically and of course, skyscrapers are not the only thing we can construct for Lord Krishna. Srila Prabhupada is not misquoted in the story. He is misquoted in the project brief that ISKCON has prepared and has been circulating. In fact, if you read the story carefully, you will realise that all other environmentalists and religious leaders are saying that PrabhupadÃ”Ã‡Ã–s words are being misinterpreted by ISKCON. A monk in Chaitanya Gauriya Mutt in Vrindavan, on Srila PrabhupadÃ”Ã‡Ã–s message to build a skyscraper for Krishna, says that PrabhupadÃ”Ã‡Ã–s words must have a deeper meaning. However, ISKCON is isolating ParbhupadÃ”Ã‡Ã–s words from its context. My question to you, Mr Reddy, is why is ISKCON investing in a skyscraper instead of farms (that Prabhupada has been teaching about)? You will find the answer in the story. I would like to highlight few of the things regarding ISKCON project in Vrindavan which you might not be aware of. As rightly said by Mr. Mohan Sundar Reddy Prabhupada's comment on skyscrapper here has been misquoted and he said that in the sense that everything can be utilized in the service of Krishna. Prabhupada has clearly mentioned in his various lectures multiple times that building of magnificent temples is not the primary objective of ISKCON. He always stressed that Krishna consciousness can be propagated only when his disciples will perform more and more Harinama Sankirtan and book distribution. Temples are only meant to facilitate these activities and attract materialistic people to Krishna Consciousness. And definitely he would have never approved building such a project in Vridavan at the cost of environment. I would like to make you aware that Vrindavan Chandrodaya Mandir is not ISKCON's project. It is ISKCON Bangalore's project which is now separate from original ISKCON established by Prabhupada. ISKCON Bangalore is now deviated from original vaishnava philosophy and guru paramapara system given by Prabupada nor they are following any instructions and suggestions from main ISKCON Governing Body Commission (GBC) and their own Deeksha Guru. Since they are deviated, it is very likely that they can make such mistakes" as taking literally meaning of Prabhupada's words and propose such a project in Vrindavan. Currently court case is also going on for ISKCON Bangalore temple ownweship. Also main ISKCON (headquaters Juhu, Mumbai) is not supporting any Akshay patra foundation activities. They are separate. Main ISKCON has already won the case in high court and it is now in Supreme Court. If ISKCON Juhu wins the case, ISKCON Bangalore will not be able to use name "ISKCON" for all its activities which currently they are using, inspite of not following GBC. It is very painful to see that ISKCON Bangalore's activities are bringing such an infamy to Prabhupad's mission which was only aimed at reducing people's sufferings by spreading Krishna Bhakti. It is my humble request to you that please mention complete name " ISKCON Bangalore" and not just "ISKCON" if you write anything about their activities. Many people are not aware that they are separate because they use the same name ISKCON. I pray to Lord Krishna that this issue resolves soon. Savyukta Narsimha Dasa said that " We are literalists.Ã”Ã‡Ã˜ In actual ISKCON Bangalore's people are neither following Guru and Shastra symbolically nor literally. Prabhupada has said that GBC (Governing Body Commission) is my mouthpiece and all other devotees should follow their instructions. Vrindavan Chandrodaya Mandir project is not approved by ISKCON GBC. Hence, ISKCON Bangalore is not following all Prabupada's instructions literally. They are picking only things which are in their own interests. There is already an ISKCON temple in Vrindavan which is serving all the purpose of ISKCON. Prabhupada never said that they need another huge one in Vrindavan. Also he never wished that his temples become just a tourist place. Kindly highlight this and clarify this in your article so that people will not have any negative image of ISKCON in general.